Our post about tuition is one of the most popular on the blog. So, I thought a piece highlighting some of the most affordable private schools would be useful. I selected private elementary schools with tuition lower than $15K per year. There’s nothing magical about tuition under $15K except that less expensive schools can be hard to find. I also know families at most of these schools and I’ve great things about them all. Tuition is usually listed in the “admissions” section of school websites. Please note that tuition listed is for 2014-15 and does not include additional one-time fees, If you’re looking for a budget-conscious private elementary school, you should definitely check out these schools! 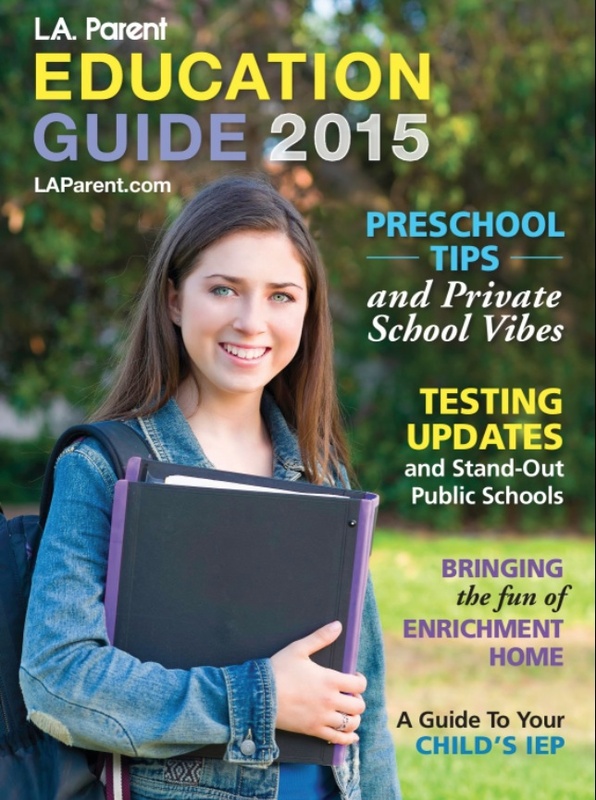 Read the article on L.A. Parent. Guest Blogger Alice: The Letters Are Coming! It’s nearly March and there is nothing left to do but wait. Private elementary school admissions letters all come out on the 13th and emails are sent on the 14th. For Pasadena, it’s March 6. At this point, you’re not sure which sedative to take and you can’t be seen drinking before noon. It’s time to develop other coping strategies. Don’t talk about it with all the other parents you know who are applying to schools! Stop looking at the application materials that state the date. Knowing it’s vaguely in March is much more relaxing than knowing the exact day, trust me on this. Don’t call the admissions director “just one last time”. If it’s too late for you and the date is ingrained in your psyche then you have to engage in more rational behaviors. The most rational by far is to know your back up plan. If you have a solid back up plan that you can actually live with, you are way ahead of the game. So while you already likely have a first choice, second and third, you should also have the nuclear option. You need to be able to answer the question: What if my brilliant, perfect, deserving child gets in nowhere? L.A. is insanely competitive and it has happened. Also, if you know the school you want is right and you either didn’t get in, or were wait-listed, don’t make a series of panicked calls the day you get your letter. Along the way I’ve been on a few wait-lists, my son at Buckley, a daughter at Harvard-Westlake… and being the one pestering the schools over the weekend won’t help your cause. The schools purposely time things so your letter comes on a Friday and emails on a Saturday morning. They do this so you –and they–have the weekend to calm down. Wait until you are very calm and purposeful and it’s at least a Monday before you call. Know what you want to say, write it down if need be. This will go a long way if your goal to keep good relations and reapply. Back up plans vary from family to family, from giving a young child more time in preschool to enrolling in public school, to moving out of town, or out of state. There are families who really do choose to move when things go south. If public school is NOT an option for whatever reason, and if you live in L.A. on purpose, it’s not a bad idea to know some of the other lesser-discussed private options. There are church and temple schools that are less competitive and some take rolling applications. There are Montessori’s that don’t require you know anyone of the Board of Directors or currently working in the White House. That was our back up for kindergarten. We had a very good Montessori that went through sixth grade that we could have lived with. There are for-profit private schools that are small and not too swanky, but who will take great care of your child as you contemplate reapplying next year. And that of course, is the final answer. If you know you belong somewhere, you can reapply next year and if nothing else the school will value your commitment. Also, use time between now and then to look honestly at your child, your family and the application you wrote and make sure you’re putting your best foot forward. Are their some weaknesses that might be addressed? If, for example, you did things on your application like drew pretty pictures, or used multiple color pens in order to stand out, next time – don’t do that. (I know from a friend’s experience it doesn’t work). Maybe your child does need to address some social or academic issues you thought weren’t important. Perhaps the school is like a country club and your family is the outsider. That’s a difficult hurdle to overcome, no matter how wonderful your kid is. Also, if you know the school you want is right and you either didn’t get in, or were wait-listed, don’t make a series of panicked calls the day you get your letter. The schools purposely time things so your letter comes on a Friday and emails on a Saturday morning. They do this so you –and they–have the weekend to calm down. Wait until you are very calm and purposeful and it’s at least a Monday before you call. Know what you want to say, write it down if need be. This will go a long way if your goal to keep good relations and reapply. In the end, hopefully you’ll be pouring the wine to celebrate rather than drown your sorrows, but know, as vital as this all feels right now, in the larger scheme of lives well lived, children becoming adults and prospering, it really just a tiny bump in the road. Perspective is everything. Cheers. 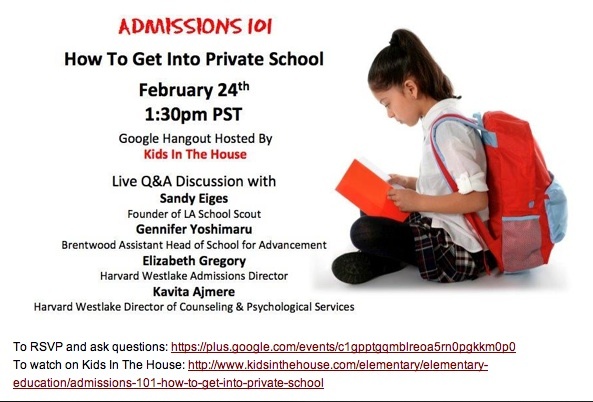 Here’s an informative primer on what’s required to apply for private school financial aid by our good friend, Sandy Eiges of L.A. School Scout, an L.A. area educational consulting company. To see our interview with Sandy, click here. 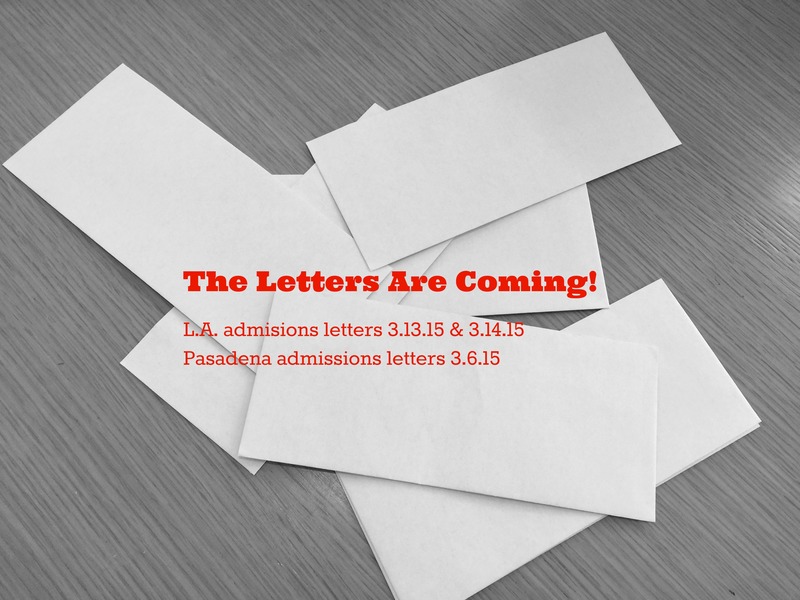 We’ve come to that part of the private school admissions cycle where everything is coming due at the same time – teacher recommendations, head of school recommendations, transcripts, and for those of you applying for financial aid, tax returns. For those of you wondering whether you qualify for financial aid, wonder no longer. The answer is – maybe! The truth is that every school has a different amount of financial aid available in any given year. Coupled with a different income ceiling per school, this makes it challenging to determine whether you qualify or not. Some schools focus on ethnic diversity in their financial aid calculations; some expand that to include socio-economic diversity as well. If a large school commits a sizeable percentage of their annual income to financial aid, then clearly they will have deeper pockets and will have more aid available than a smaller school might. Applying for financial aid is a very challenging process. While I’ve covered this before, I’m reviewing the steps here. 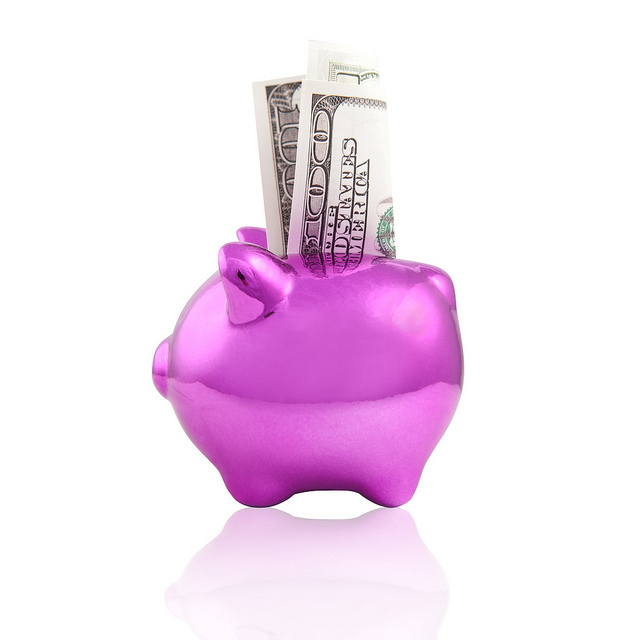 For some schools it’s not too late to submit a financial aid application. For all schools there is one part of the application due by February 1st – your tax returns. 1. Have your economic house in some kind of order. Once you apply to a school they will ask if you are applying for financial aid. If you are, they will send you specific instructions. While the application isn’t due until February, and you can complete most of the application online, you will have to add supplemental materials. You will need copies of previous years’ tax returns – for some schools it’s one year, for others it’s two. The tax return for the current year will need to be completed and submitted in January, just to meet the deadline. You will need to itemize every expense and all of your income. If you are divorced, both parents’ incomes are used in the calculation, whether or not both parents are contributing to tuition – or even on speaking terms! Be aware that many schools have two aid applications – one you access online, and one that belongs specifically to a particular school. You will need to complete them both. 2. Expect to pay some tuition. Very few schools offer full financial aid these days. The more typical scenario is that if you qualify, the school will offer up to 2/3 of the payment. That means that you should expect to pay at least a third of the tuition. 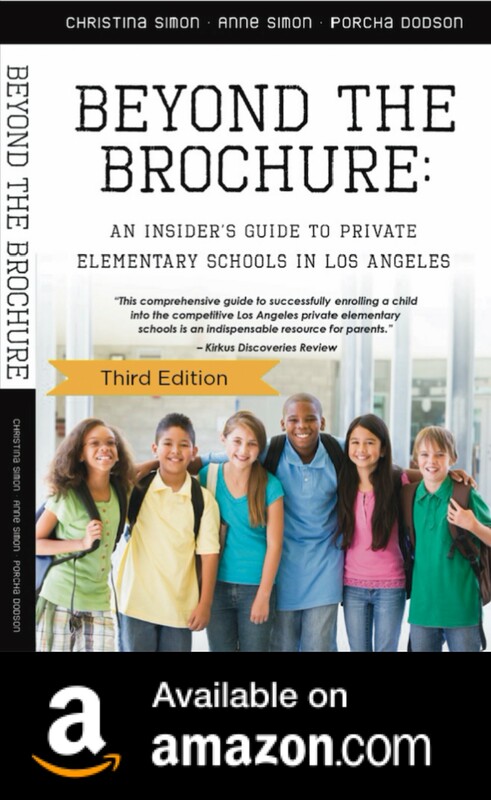 At the average L.A. private elementary school, tuition ranges from $18,000 – $25,000 per year. For middle and high school, it can go as high as $35,000 – $40,000 per year. You do the math! 3. Financial Aid applications are online. 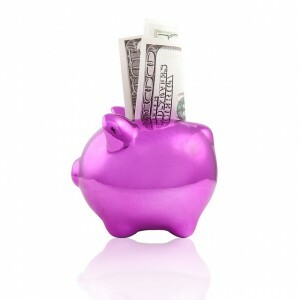 There are two main sites that process financial aid applications – the National Association of Independent Schools School & Student Services application (NAIS/SSS): http://sssbynais.org. 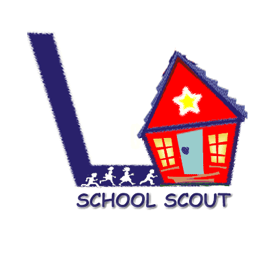 “We estimate the amount you can contribute to school expenses and forward that estimate to the schools where you’re applying. It’s one form, for one fee, for any number of siblings, for any number of schools.” and FAST (the schools you are applying to will forward the link to their application). To repeat, once you enter your information they will estimate what they think you can afford. You will also be asked what you can afford. This isn’t the amount of aid you will necessarily receive, but it’s always a good idea to ask for what you need. Whether you use the FAST form or the SSS form, you will only have to submit one set of materials to each, which will be used for all the schools you specify. Both sites make it easy to upload supplementary materials, such as tax returns. Unfortunately if some of your schools use one form and some the other, you will have to fill out two separate forms. Just as with school applications, it might be easy to press “submit” – but don’t submit until you’ve checked and double-checked the accuracy of your answers, and especially of your numbers. And of course you should always keep a copy. While you might be tempted to wait until your child is admitted to a school before submitting an application for financial aid, applications are due prior to admission. If you applied and got in, but only now realize that you really need financial aid, you can always ask – but it is highly unlikely that there will be any aid left. Aid normally goes first to faculty and staff for their children, then to current students at the school, and then to new acceptances. If you apply late, you risk losing any access to financial aid. For the most part complete financial aid applications, including current year tax returns, are due by February 1st. If you can get the application done early, then by all means take care of it. Then if all you need to do is upload one tax form on the due date, so much the better.